I'm not really interested in celebrities; I don't read the celebrity magazines or watch any of the talk shows that celebrities frequent. I have no idea who most of the movie stars are today. And I never watched Larry King Live. But Truth Be Told by Larry King was actually quite interesting. It's a memoir by the talk show host in which he shares memories and stories of his life on radio and television. The subtitle sums up the purpose of the book: Off the Record about Favorite Guests, Memorable Moments, Funniest Jokes, and a Half Century of Asking Questions. It honestly made me want to go back and watch old episodes to see King's interviews! The memoir is split up into chapters that focus on certain topics, such as Time, Riches, Music, Politics and The Finale. King shares his memories and anecdotes from his life as a broadcaster, first in Miami on radio, and later on CNN. As with most memoirs, some chapters were more interesting than others. There's very little personal information revealed about King. We learn that he was on welfare as a child, and we hear a bit about his marriage and the pain he feels when comedians and others make fun of his marital problems. But mostly, this is a book about other celebrities and King's interactions with them. He has met some amazing people. Not just movie stars and rock stars, but politicians and important people from around the world. And his stories about them, as well as the stories they've told him, which he recounts in this memoir, are fascinating. He also shares the events that led up to the final episode of Larry King Live. He talks about the circumstances that resulted in the show's ending, and his feelings about the end of such an important part of his life. 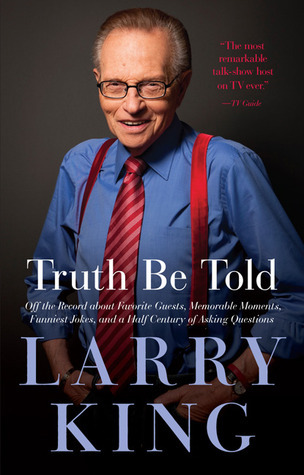 For fans of Larry King, this is a must read. For those who enjoy celebrity gossip and stories, I highly recommend it. Truth Be Told is an interesting account of life in broadcasting, and the extraordinary experience of engaging with so many celebrities, politicians and other interesting individuals. Larry King, author of Truth Be Told: Off the Record about Favorite Guests, Memorable Moments, Funniest Jokes, and a Half Century of Asking Questions, was the host of CNN's Larry King Live, the first worldwide phone-in television talk show and the network's highest-rated program for twenty-five years. the Emmy-winning King also founded the Larry King Cardiac Foundation, which has raised millions of dollars and provided lifesaving cardiac procedures for nearly sixty needy children and adults. I'd love to read TRUTH BE TOLD thank you.